Six adorable newborn French bulldog puppies which were stolen at knifepoint from a pregnant woman earlier this week have died. Armed robbers stole a litter of day-old bulldog puppies after threatening a heavily-pregnant woman and her three young children on Tuesday. Two male puppies of the eight which were stolen have survived the ordeal and have been returned to their mother. The shocking raid unfolded in the Stretford area of Manchester when two hooded men burst into the family home of Leeanne Corbett. They demanded cash and mobile phones before making off with the eight French Bulldog puppies. Ms Corbett received an anonymous phone call this morning to say the puppies had been handed been handed into a vets. They were treated with antibiotics and were treated for around an hour at the vets. Speaking after the raid on Tuesday, Ms Corbett, 26, said she thought her partner had arrived home when she heard the doorbell but when she answered the door she was pushed into the kitchen and held a butcher's-style knife to her stomach. The raiders demanded money from the sale of the dogs, but she replied they are only a day old and had not yet been sold. The gang then wrenched a Playstation from her seven-year-old son's hands, but left the console after the mother pleaded with them not to take it. An incubator in which the puppies were being kept was then taken from the house and the pair disappeared. Ms Corbett said the litter could die if they are not fed for more than 36 hours. 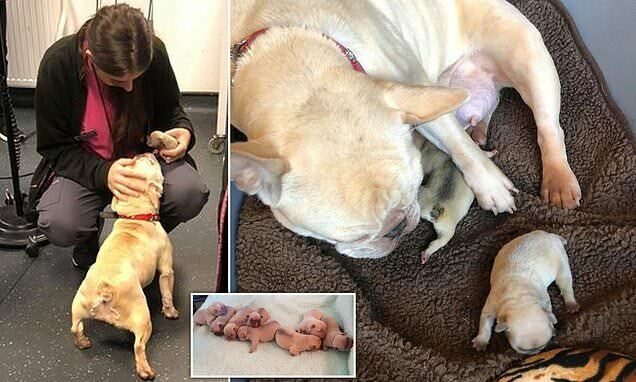 She released a heartbreaking picture of the puppies mother, family pet Reign. The mother dog is said to be biting her paws because she is so distressed.